For other people named Tom Benson, see Tom Benson (disambiguation). Thomas Milton Benson (born July 12, 1927) is the owner of the New Orleans Saints and New Orleans Pelicans. Benson was born in New Orleans, Louisiana, to the late Thomas Benson, Sr., and the late Carmen Benson. He served in the U.S. Navy and then graduated with an accounting degree at Loyola University of New Orleans in 1948. After school he worked as a car salesman at Cathey Chevrolet in New Orleans. In 1956, he moved to San Antonio to try and revive a poorly performing dealership; he was granted a 25% interest in the dealership for his efforts. In 1962, he became full owner of Tom Benson Chevrolet. He is the owner of several automobile dealerships in the Greater New Orleans and San Antonio areas. Benson became wealthy by investing profits from his automobile dealerships in local banks. He eventually purchased several small Southern banks and formed Benson Financial, which he sold to Norwest Corporation in 1996. He purchased the Saints from John Mecom in 1985 after he learned from Governor Edwin W. Edwards that the team was on the verge of being sold to parties interested in moving the team to Jacksonville, Florida. As a successful businessman, he recognized the economic implications of such a move not only for the city of New Orleans, but for the state of Louisiana as well, which was in the midst of a deep economic recession caused by plummeting crude oil prices. Ownership of the team was officially transferred to him on May 31, 1985. Shortly after acquiring the Saints, he gained a reputation as one of the more popular and colorful owners in the league. He hired general manager Jim Finks and head coach Jim Mora, who led the Saints to their first winning season and playoff appearance. His popularity later declined, however, after numerous attempts to persuade the state of Louisiana to construct a new stadium for the Saints to replace the aging Superdome, suggesting that he might move the team elsewhere if said stadium were not built. His popularity hit an all-time low in late 2005 after it appeared he was trying to move the team to San Antonio after Hurricane Katrina ravaged New Orleans. (See Relocation controversy below for more details.) He later stated that the Saints would return to New Orleans for the 2006 season, which they did. The team's fortunes improved dramatically in the years after their return, including a 31–17 defeat of the Indianapolis Colts on February 7, 2010 to win Super Bowl XLIV, and Benson recovered much of his popularity as well. On July 18, 2008, the Benson-led Louisiana Media Company consummated their purchase of WVUE-DT, the Fox affiliate for the New Orleans area and by virtue of their affiliation, the major carrier of Saints games as part of the NFL on Fox contract. Since the sale, the station has also become the de facto home of the Saints, including coach's shows and preseason games. Benson is well known for doing the "Benson Boogie" after Saints home victories. Benson, in true New Orleans fashion, would second line dance down the field of the Superdome in the closing minutes of the game while carrying an umbrella decorated in black and gold. He is often called "Boogie Benson" by Michael Wilbon on ESPN's Pardon the Interruption. During the Saints' 2001 negotiations with the state of Louisiana, rumors circulated that Benson would seek relocation if his requests — which included renovations to the Superdome, a new practice facility in suburban Metairie, and escalating annual payments from the state to the team — could not be met. Though he never made public statements to this effect, Benson's business ties to the city — and the availability of the Alamodome as a playing facility — made San Antonio the most common subject of speculation. When it became clear that Hurricane Katrina's extensive damage to New Orleans and the Superdome would make it impossible for the Saints to play there in 2005, the team temporarily relocated its operations to San Antonio and began negotiations to play home games at the Alamodome. (The Saints, after discussions with the NFL and Louisiana State University, eventually agreed to play one "home" game at Giants Stadium against the Giants, three games at the Alamodome and four games at LSU's Tiger Stadium in Baton Rouge). At the Saints-Falcons game on October 16, the second of two warm receptions of the Saints by the San Antonio community, mayor Phil Hardberger stated that Benson had agreed to schedule negotiations for permanent relocation once the 2005 season is over. In reference to Benson, Hardberger said, "I'm pretty comfortable in saying he wants to be here." On Monday, October 17, Benson dismissed executive vice president Arnie Fielkow, who had been a public advocate of the Saints' importance to the state of Louisiana, and who had advocated the playing of home games in Baton Rouge. According to Fielkow, Benson told him that if he'd tender his resignation and sign a confidentiality agreement, he'd be paid the remainder of his contract; when he refused, he was fired outright. Benson's actions quickly drew outrage from Saints fans as well as local and state officials. On Wednesday, October 19, New Orleans mayor Ray Nagin sharply criticized Benson for acts he deemed heartless and opportunistic. Said Nagin: "For them to be openly talking to other cities about moving is disrespectful to the citizens of New Orleans, disrespectful to the Saints fans who have hung in with this franchise through 30-something years under very trying times." Two days later, Benson publicly stated that he has made no plans to move the Saints to San Antonio. "There are many factors that will affect the future location of our team", Benson said. "That is also true of many other New Orleans-based companies that are faced with deciding their future homes." He said he would make no decisions about the team's future until the 2005 season was over. On Wednesday, October 26, Benson reiterated his commitment to the New Orleans area in the form of a full-page ad in newspapers around the region. The ad, a letter entitled "Tom Benson Wants to Return to New Orleans", acknowledged the negative reaction surrounding the team's recent actions, but promised that no decision has been made regarding the team's future. Said Benson in the letter, "It is too early to determine, but my desire is to return to New Orleans." Benson's firm but noncommittal stance compared unfavorably to the statements of the New Orleans Hornets, the city's displaced NBA team. Though the Hornets played all but a handful of games during the 2005–2006 and 2006–2007 seasons in Oklahoma City — and even temporarily changed the team's name to the New Orleans/Oklahoma City Hornets, the basketball team's ownership insisted they would return to the recovering city as soon as possible. The Hornets also announced a community relations initiative to keep the team involved in the New Orleans area. NFL Commissioner Paul Tagliabue met with Benson and Louisiana governor Kathleen Blanco at the Saints' first home game in Baton Rouge on October 30. After the meeting, he stopped just short of making a formal commitment to keep the Saints in New Orleans. Said Tagliabue: "The Saints are Louisiana's team and have been since the late '60s when my predecessor Pete Rozelle welcomed them to the league as New Orleans' team and Louisiana's team. Our focus continues to be on having the Saints in Louisiana." He dispelled rumors that have the Saints relocating to Los Angeles. He also suggested that the Saints may need to focus on becoming more of a regional team, possibly implying a name change to the Louisiana Saints or the Gulf Coast Saints. Tagliabue will form an eight-owner advisory committee to help decide the team's future. That same day, Benson charged New Orleans news reporter Lee Zurik with a raised hand while leaving Tiger Stadium following a Saints loss to the Miami Dolphins and lunged at the television news crew grabbing a camera and wrenching it down before being eased away by Saints security. A video also appeared to show Benson angrily responding to a heckling fan. NFL spokesman Greg Aiello said the league would likely take no action against Benson. On November 11, 2005, an e-mail sent to Commissioner Paul Tagliabue from Benson was leaked to the press. Benson stated in the e-mail that he feared for his life, and his family's safety upon his exit from Tiger Stadium, and would not be returning to any future games in Baton Rouge. Benson declared in the email that security in the stadium was "inadequate" and claimed that his family "could all have been severely injured or killed." However, LSU officials were quick to point out that they had no negative comments from the Saints or the NFL concerning Tiger Stadium security. In addition, the videotape of Benson from October 30 showed him being escorted by at least one security guard, belying his e-mail claim that security was "non-existent." A day later, Saints spokesman Greg Bensel stated that Benson's e-mail was sent in frustration, and that Benson was undecided on whether he would attend any future games in Baton Rouge. Benson did not attend the following week's game at Tiger Stadium on November 6 against the Chicago Bears. On November 4, 2005, Benson made a deal with Louisiana governor Kathleen Blanco that would postpone two important termination deadlines in the team's Super dome lease until after the 2006 season. Benson extended his force majeure clause period until January 2007. Presumably this will keep the Saints in New Orleans until January 2007; however, Benson can still invoke the clause any time between now and then. This buys the Saints time to explore future options with state officials without having to make a decision on the future of the franchise now. This would also allow the state to focus on more pressing needs in the recovery efforts from Hurricanes Katrina and Rita, while allowing the Saints more time to determine whether the region's economy could rebound enough to continue supporting the franchise. In the midst of this controversy, several groups of investors have approached Benson with offers to buy the team and keep them in Louisiana, the most publicized group being one led by Fox Sports analyst and former Pittsburgh Steelers quarterback Terry Bradshaw, who is a Louisiana native. However, Benson has expressed that he has no intentions of selling the team and plans to eventually hand down ownership to his granddaughter, Saints owner/executive Rita Benson LeBlanc. Benson spoke to press following an NFL owners' meeting on November 15, at which he reiterated that the team is not for sale, but also stated that other NFL owners, along with Tagliabue, were working with him to keep the team in New Orleans. On December 17, ESPN reported that Benson had told Saints players that he planned to keep the Saints in San Antonio for the 2006 season and possibly beyond, and that he was willing to sue the NFL for the right to stay there. This was days after NFL Players Association director Gene Upshaw advised the Saints players not to renew their leases on their homes in San Antonio because the league planned to order them to return to their home facilities in Metairie. This was also a few days after Benson had reportedly told his staff that they could not return to their Metairie facilities because it was still being occupied by FEMA and National Guard officials and that the New Orleans area had become "unlivable." The State of Louisiana responded by sending Benson a formal letter asking him and the Saints organization to return to the facility at the end of the 2005 season. Included with the letter were statements from FEMA and the National Guard stating that they were no longer using the facility. On December 30, two days before the Saints' final game of the 2005 season against the Tampa Bay Buccaneers, Benson announced at a press conference that the Saints will return to their Metairie facility at the end of the 2005 season, and that the team would play as many of their home games as possible during the 2006 season in the Louisiana Superdome, which he said could be ready as early as mid-September, 2006. On 2006-01-11 Benson and Tagliabue announced plans to play all of their 2006 home games in the Superdome. Tagliabue also stated that the NFL was committed to keeping the Saints in New Orleans beyond 2006, calling it a "multiyear effort" and not just a one-year deal. He also stated that the NFL was talking with city officials about possibly hosting another Super Bowl there in the near future, which would be the city's 10th. Benson stated that he was committed to New Orleans "forever, as long as the community commits to me". In 1992, Benson made a deal to acquire the Charlotte Knights AA minor league baseball team and bring them to New Orleans for the 1993 season, renaming them the "Pelicans" after New Orleans' old minor league team, but the transaction was thwarted when the Denver Zephyrs AAA team relocated to New Orleans to make way for the major league Colorado Rockies. In 1998, he was granted a license for a team in the Arena Football League, which began play in 2004 as the New Orleans VooDoo. On April 13, 2012, Benson bought the New Orleans Hornets, now known as the New Orleans Pelicans, from the NBA for $338 million. The Benson family established an endowment fund at Central Catholic High School, in San Antonio, Texas dedicated to the memory of their son Robert Carter Benson, who graduated from the school in 1966. Tom Benson also donated the Benson Memorial Library at Central Catholic. Robert Carter Benson died of cancer in 1985, at the age of 37. Benson and his family long have been ardent supporters of University of the Incarnate Word in San Antonio.The Gayle and Tom Benson Stadium officially opened on campus September 1, 2008, when the Bensons joined with more than 2,000 Cardinals fans and athletes to declare the facility ready for action.The stadium is wide enough and long enough that the Cardinals soccer teams, men's and women's, have begun playing their games here. Also in San Antonio, Texas at St. Anthony Catholic School there is a Library named after Benson's son who died of cancer. September 23, 2010, Benson donated $8 million to Loyola University New Orleans in what will be called the Benson Jesuit Center. In January 2012, Benson and hs wife were awarded the Pro Ecclesia et Pontifice for their generosity to Catholic Church, the highest papal honor that Catholic laypeople can receive. In November 2012 Tom Benson and his wife, Gayle, donated $7.5 million towards the construction of Tulane University's Yulman Stadium. The stadium, which opened in 2014, brought the Green Wave back to campus for the first time since the demolition of Tulane Stadium in 1980. The playing surface is known as Benson Field. In November 2014, Fawcett Stadium at the Pro Football Hall of Fame in Canton, Ohio was renamed "Tom Benson Hall of Fame Stadium" in recognition of a $11 million donation by Tom Benson. After purchasing a home in the exclusive Audubon Place neighborhood in New Orleans, Benson is now a resident of his hometown again. His brother, Larry Benson, has also been in sports ownership and owned the San Antonio Riders of the World League. Benson has been married three times. His first wife was Shirley Landry who is deceased. In 2003, his second wife, Grace Marie Trudeau Benson (born March 1, 1927), died of Parkinson's disease. In October 2004, he married Gayle Marie LaJaunie Bird. Tom Benson and his first wife Shirley adopted three children: Robert Carter Benson, Renee Benson, and Jeanne Marie Benson. Renee Benson has two adult children, Rita LeBlanc and Ryan LeBlanc. Rita Benson LeBlanc was Saints owner and executive vice president until Tom Benson fired her, her brother Ryan and her mother Renee, and wrote them out of his will. She, along with her mother Renee and brother Ryan LeBlanc, then sued Tom Benson claiming he is incompetent, and for control of his companies. Benson's only living child, as of January 2015, is Renee. In January 2015, after Tom Benson announced that he had cut his estranged adopted daughter Renee Benson and her adult children out of his will, he was sued by Renee and Renee's two children, Rita LeBlanc (also known as Rita Benson LeBlanc) and Ryan LeBlanc of Texas. One of Renee, Rita and Ryan's complaints in the lawsuit is "Upon information and belief, under the apparent supervision of Gayle, the diet of Tom Benson has drastically deteriorated, with him rarely consuming full, nutritious meals, but instead, for some reason, subsisting on candy, ice cream, sodas, and red wine." Renee Benson, Rita LeBlanc and Ryan LeBlanc are suing for control of Tom Benson's companies including the NFL's New Orleans Saints and the NBA's Pelicans, claiming he is "incompetent". Tom Benson released a statement saying that the lawsuit and claims against him by his adoptive daughter and her children are false and meritless. In February 2015, Probate Court Judge Tom Rickhoff named former San Antonio Mayor Phil Hardberger and attorney Art Bayern as co-executors of the testamentary trust of Shirley L. Benson. The two replace Benson as trustees of the estate. On June 18, 2015, a judge found him competent. On February 19, 2016, Judge Rickhoff approved the appointment of Renee Benson, Benson's estranged adopted daughter, as administrator of the $1 billion Shirley Benson Testamentary Trust, which includes the Lone Star Capital Bank in San Antonio, half of five automobile dealerships, part of a large ranch near Johnson City, Texas, a home at Lake Tahoe, Nevada, an airplane, and cash and other real estate holdings. Benson's attorney said his client after much wrangling and two weeks of mediation chose to settle the dispute so as to live his remaining time at peace and to relieve himself of a hefty tax burden required on those assets. 1 2 "Hornets sale to Saints owner Benson official". NBA.com. Retrieved 19 June 2015. ↑ Phinisee, Tamarind; Lowe Sanchez, Sandra (2003-03-09). "Auto magnate Tom Benson jumping back into bank biz". San Antonio Business Journal. Retrieved 2013-12-28. ↑ Judy Battista, " In Step: Benson Shares In The Recovery Of New Orleans", The New York Times, January 28, 2013. ↑ Nakia Hogan, "With Super Bowl 2013 approaching, Tom Benson remains in the spotlight", Times-Picayune, January 26, 2013. ↑ "Mayor, Saints owner to negotiate at season's end". ESPN.com. Associated Press. October 17, 2005. ↑ "Saints dismiss executive Fielkow". ESPN.com. Associated Press. October 18, 2005. ↑ "Nagin blasts Saints owner for trying to move team". ESPN.com. Associated Press. October 19, 2005. ↑ "Benson says he has no San Antonio plan". ESPN.com. Associated Press. October 21, 2005. ↑ "New Orleans' pro teams reaffirm ties to battered city". ESPN.com. Associated Press. October 26, 2005. ↑ "Saints are expected back in Superdome". Houston Chronicle. Associated Press. January 11, 2006. ↑ "Displaced Zephyrs Stay Silent on Stadium Site in New Orleans", Deseret News, November 25, 1992. ↑ "Charlotte AA team needs new home", Associated Press in TimesDaily, January 25, 1993. ↑ Tulane's field to be named for Benson – San Antonio Express-News. Mysanantonio.com (2012-11-02). Retrieved on 2013-07-29. ↑ "New Orleans Saints owner Tom Benson pledges $11 million to Pro Football Hall of Fame". ESPN.com. Retrieved 19 June 2015. ↑ Moran, Kate. "Tom Benson's home tops list of the most expensive metro area houses sold in 2008". The Times-Picayune Blog. Retrieved 29 December 2013. ↑ Jaquetta White (February 9, 2015). "Little-known daughter of Tom thrust in spotlight". The Advocate. Retrieved February 9, 2015. Tom Benson and his first wife, Shirley, adopted a 5- or 6-month-old Renee Benson from the St. Vincent de Paul orphanage in New Orleans almost six decades ago. The couple could not have children of their own. Renee was their middle child. A son, Robert Carter, was eight years older, and a daughter, Jeanne Marie, called "Tootsie," was four years younger. ↑ Nick Underhill (January 24, 2015). "Tom Benson's new Saints, Pelicans succession plan has 'unequivocal support' from GM Mickey Loomis". The New Orleans Advocate. Retrieved January 24, 2015. Renee Benson, who was adopted by Tom Benson and his first wife, Shirley, and her son, Ryan, are also no longer associated with the teams. ↑ Brian Solomon (April 23, 2012). "Billionaire Tom Benson Benches Granddaughter, Presumed Heir, For Her "Sense Of Entitlement"". Forbes. Retrieved January 24, 2015. ↑ Jeff Duncan (April 22, 2012). "Rita Benson LeBlanc's conspicuous absence at high-profile events leaves some wondering about her future with N.O. 's sports franchises". The Times-Picayune. Retrieved January 24, 2015. ↑ Jeff Duncan (January 21, 2015). "New Orleans Saints, Pelicans ownership shocker: wife Gayle, not granddaughter Rita, will control empire after Tom Benson dies". The Times-Picayune. Retrieved January 24, 2015. Rita Benson LeBlanc, Renee LeBlanc and Ryan LeBlanc were removed from the Saints' staff directory Wednesday night; Rita also had the title of vice chairman of the board with both franchises.…. Renee and Ryan Benson also have been shut out from Benson's operations. Their offices at the team's facility on Airline Drive have been closed. ↑ Mike Triplett (January 23, 2015). "Controversial ownership decision intended to bring stability to Saints, Pelicans". ESPN.com. Retrieved January 24, 2015. Multiple sources within the two sports franchises, both on and off the record, applauded the move. Many believe the transition will be much smoother if Gayle Benson becomes owner instead of Tom Benson's adopted daughter, Renee Benson, and grandchildren Rita Benson LeBlanc and Ryan LeBlanc. ↑ Brett Martel, Associated Press (January 22, 2015). "Tom Benson's relatives sue over their ouster from ownership positions with Saints, Pelicans". The Vancouver Sun. Retrieved January 24, 2015. ↑ "Saints, Pelicans owner asks judge to dismiss heirs' lawsuit". Fox Sports. AP. January 27, 2015. Retrieved February 9, 2015. ↑ Darin Gantt (January 23, 2015). "Tom Benson says he feels "Great, just like a 50-year-old"". NBC Sports. Retrieved January 24, 2015. Benson created a stir when he announced that he was taking away future control of his assets from his daughter and grandchildren and transferring them to his current wife. They in turn sued him, claiming he wasn’t competent to do so, in a bizarre suit that claims his Gayle Benson is manipulating him, including the claim that she's feeding him mainly candy, ice cream soda and red wine. He in turn issued a statement saying he was perfectly capable of handling his own affairs, and that he’d fight the lawsuit. ↑ Tom Ley (January 23, 2015). "Suit: Saints Owner Tom Benson Is Being Manipulated By His Scheming Wife". Deadspin. Retrieved January 24, 2015. Upon information and belief, under the apparent supervision of Gayle, the diet of Tom Benson has drastically deteriorated, with him rarely consuming full, nutritious meals, but instead, for some reason, subsisting on candy, ice cream, sodas, and red wine. ↑ Mike Triplett (January 23, 2015). "Bensons at odds over businesses". ESPN.com. Retrieved January 24, 2015. Benson, 87, announced Wednesday that he plans to hand over control of the franchises to his wife, Gayle, in the event of his death. But Benson's adopted daughter, Renee Benson, and grandchildren Rita Benson LeBlanc and Ryan LeBlanc filed a lawsuit Thursday claiming he should not be allowed to do so because his "health and mental capacity have significantly declined" and he has "fallen under the undue influence" of Gayle, whom Benson married in 2004. ↑ "Rita Benson LeBlanc, family file suit claiming Tom Benson incompetent to control New Orleans Saints, Pelicans". The Times-Picayune. January 22, 2015. Retrieved January 24, 2015. ↑ NOLA.com (January 22, 2015). "Read the complete Rita Benson LeBlanc family lawsuit against Tom and Gayle Benson". The Times-Picayune. Retrieved January 24, 2015. The suit was filed one day after Tom Benson unexpectedly announced plans to transfer future ownership of the clubs to wife, Gayle, cutting off his daughter, Renee LeBlanc, and his two grandchildren, Ryan LeBlanc and Rita Benson LeBlanc, who until recently had been designated as the heir apparent. ↑ Larry Holder (January 23, 2015). "Given Rita Benson LeBlanc's volatility, Tom Benson's wife Gayle best option to take reins: Larry Holder". The Times-Picayune. Retrieved January 24, 2015. ↑ Gabe Hiatt (January 22, 2015). "Spurned daughter, grandchildren sue Saints owner for writing them out of will". The Washington Post blog. Retrieved January 24, 2015. ↑ Mike Triplett (January 23, 2015). "Bensons at odds over businesses". ESPN.com. Retrieved January 24, 2015. ↑ David Hendricks (February 5, 2015). "Hardberger named co-receiver of Benson Trust". San Antonio Express-News. Retrieved March 2, 2015. ↑ "Judge finds Tom Benson competent to run Saints, Pelicans". NOLA.com. Retrieved 19 June 2015. ↑ Van Darden. "Tom Benson to remain in control of estate". KSAT. Retrieved 19 June 2015. ↑ "Tom Benson competent to run New Orleans Saints, Pelicans, judge rules". ESPN.com. Retrieved 19 June 2015. 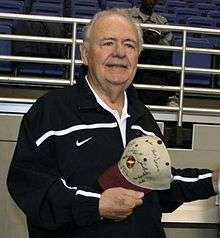 Wikimedia Commons has media related to Tom Benson.